HP Envy 23 Touchsmart is a 23.6-inch all-in-one desktop. If you find the HP Spectre One too restricted in design (a cost of elegance) or just a few thousand Naira more expensive, the HP Envy 23 Touchsmart is the next best Windows 8 AiO. It features a touchscreen display, wireless keyboard, and wireless mouse. HP Envy 23 Touchsmart is a bit bulkier than the Spectre One, but adds touchscreen, a DVD burner, and more ports. To maintain an elegant design and maximise space economy of the Spectre One AiO, HP had to sacrifice touch display and any form of optical storage, Envy 23 Touchsmart are targeted at consumers who do not mind a little more bulkiness for those features. It features a 23.6-inch full HD (1920 x 1080 pixel) display. A wireless mouse and a wireless keyboard are also included. A HD webcam with a mic is also built-in. HP Envy 23 Touchsmart runs third generation Intel Processors (Ivy Bridge core i3 or core i5) with up to 8GB of RAM. It supports up to 3TB Hard disk drive (HDD). HP Envy 23 Touchsmart all-in-one desktop features Beats Audio, HDMI-in, USB 2.0 ports, USB 3.0 ports, Ethernet port, Wi-Fi 802.11 b/g/n, SD slot, TV Tuner, and 3.5mm port. One plus that the HP Spectre One has over the Envy 23 Touchsmart as far as interfaces are concerned is NFC. Envy 23 does not currently have NFC capability. 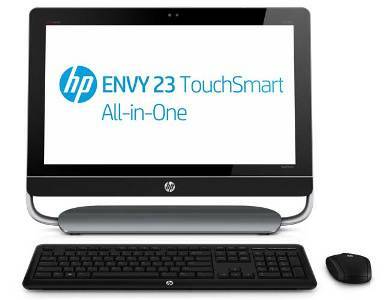 HP Envy 23 Touchsmart AiO is expected in October. It is expected to start at a price of $1,000 (N155,000).